Truth be told I didn’t expect to be so spellbound by Sunnylands. The name put me off. I rather expected a Hollywood set. The 200-acre historic estate, located in Rancho Mirage, CA near Palm Springs, is quite the opposite; filled with priceless art, gorgeous gardens, and renowned architecture where, for more than forty years, celebrities — from Queen Elizabeth to eight American Presidents — have relaxed, played golf, held high level political meetings and danced at lavish New Year’s Eve parties. Last year I didn’t get tickets to visit the estate so I wandered through the Sunnylands Center and Gardens with sculptures by Rodin and Giacometti, fine art collections, a labyrinth, and a documentary about the Annenberg’s lives and historic visits to Sunnylands. It is open September through June, Thursday through Sunday, 9:00-4:00. Free admission. Constructed in the Mid Century Modernism architectural style, Sunnylands was the winter home of Walter and Leonore Annenberg and has a long and colorful history including visits by Prince Charles, Hilary Clinton, Bill of course, the Bushes, the Nixons, Ronald and Nancy Regan, Margaret Thatcher and Supreme Court Justice Sandra Day O’Connor. 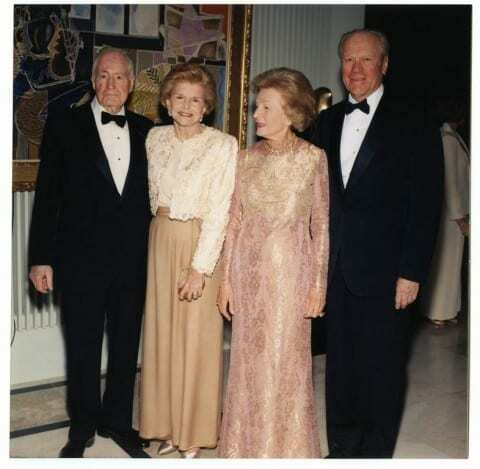 90th Birthday celebration, March 1998. Photo by Marc Glassman. From the moment I entered the Mid-century Modern house I was speechless – at the center of an open space amid 300 live flowering pink bromeliads, surrounding a pool of water stands August Rodin’s sculpture of Eve. I felt like I was alone with Eve in the garden of Paradise. Oh yes, don’t overlook the 1300-year-old Tong Dynasty Chinese ceramics with tri-color glazes, Stuben glass masterpieces, porcelain pill boxes, a Hindu Temple door with silver repouse and digital reproductions of all the Impressionist paintings that hung in the home until Walter Annenberg gave them to the Metropolitan Museum of Art in New York City. You’ll recognize the works of Van Gogh, Cezanne, Picasso, Renoir, Gauguin and Picasso. In the Room of Memories you’ll see Rembrandt Peale’s portrait of George Washington and a collection of Christmas cards from the Queen to the Annenbergs. If you can take your eyes off the priceless art pieces, you’ll be equally wowed by the expansive views of undulating green golf courses and seven lakes against the dramatic dry backdrop of steep mountains. The tour of the estate includes a golf cart ride around the grounds where you’ll see ponds, ducks, the “Eisenhower Palms”, a totem pole carved by the Canadian Inuit First Nation and kinetic sculpture by the renowned Israeli sculptor Yaacov Agam. A tour of the historic estate requires advance planning. The Historic Estate Tours include the A. Quincy Jones-designed home and are available Thursday through Sunday by reservation. Tickets can be purchased online at www.sunnylands.org. Tickets for tours are release to the public on the first and fifteenth of each month at 9:00am PST. Check out the Calendar for family-day programs, lectures, performances, music in the gardens, Plein Air painting in the gardens, bird watching tours, and a “Nightlife Series” for young professionals.